Fit-Ink: Sign Me Up, Scotty! There's a New Ironman! Southern Utah, rocks, canyons, more elevation than I'll ever see at home. I've never even been to a spot in Utah other than Salt Lake and the nearby ski country, but I'm asking to be beamed to St. George...specifically around the date of May 1, 2010. Ironman athletes rejoiced when the World Triathlon Corporation announced that another Ironman triathlon was being added to the North American roster. Now instead of fighting over the roughly 2,200 spots in the seven existing races, there's one more to battle over. Or maybe that means less shoving and more sharing. Either way, I'll take it, even if it means another battle with my fingers over signing up online (2009 races in Canada, Florida and Arizona almost happened but I talked myself out of my craziness each time). For all those triathletes fighting for a coveted spot in a North American race, come 2010 there will be one more to add to the roster. The World Triathlon Corporation announced the release of Ford Ironman St. George, an endurance event set to be held on May 1, 2010. Registration is already open at ironmanstgeorge.com. Utah once had an Ironman-distance race years ago, but it hasn't been on the repertoire since about 1999. 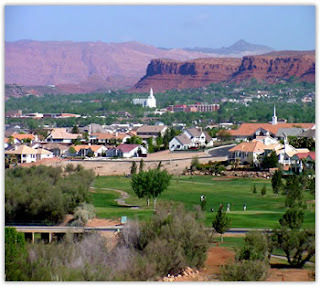 Now St. George and its surroundings will be home to the 2.4-mile swim, 112-mile bike and 26.2-mile run. The race will cover Utah scenery like the Sand Hollow Reservoir, Snow Canyon and Red Cliffs Desert Reserve. And for all those looking for a way to get into Kona and the 2010 Ironman World Championships, this race will have 65 slots for the taking. Here's some more information about the course itself. Triathletes will swim one loop in the Sand Hollow Reservoir, then take to a bike course that runs through the towns of Hurricane and Washington before following a route into St. George. On the bike racers will be able to check out views of Snow Canyon. With a transition in St. George's Town Square, the racers will start the two-loop marathon course which includes a climb toward Red Cliffs Desert Reserve, a wind through Pioneer Park, traversing along Diagonal Street and more. The finish line features a backdrop of downtown St. George alongside Heritage Tower.